What Chicago needs is a movement – a dose of inspiration and change injected into our daily routines. Imagine young influencers, entrepreneurs, and characters across many industries all coming together to share their wisdom. Austin, Texas claims its South by Southwest fame, Eden, Utah claims its Summit Series fame – now it’s Chicago’s turn. Making its second annual appearance on July 14 – 17, Glappitnova presents the city’s most unique storytellers, performers and teachers. Wrapped up into one big party, the summit takes networking and interactive learning to the next level. The first wave of the organization, called Glappit, sought out tech talent to help build the initial product that would automatically share products, ideas, and information surrounding your location. But when building our product there has to be a physical presence which is developing the community. Reaching further – “to the stars,” as Nick says, the designation “Nova” was born. The first Glappitnova festival was held in February 2013 – a small gathering, just for a few hours, along Milwaukee Avenue. It was all about executing a small idea, and getting better the next time. Reacting to a high level of enthusiasm, curiosity and demand, this year’s festival expands to nearly a week of performances, storytelling and learning (and don’t forget the partying!). Mark July 14 – 17 on your calendar and purchase your tickets here. 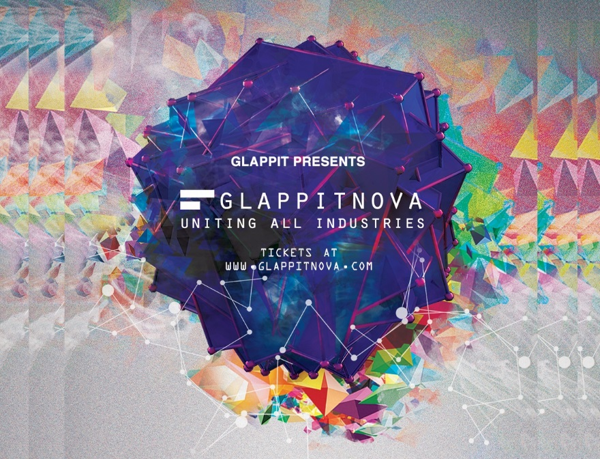 What can we expect at this year’s Glappitnova? Come with an open mind – you’ll have a great time and walk out having learned something new. Your perception of diversity across industries will be altered once you see and hear the creative, intelligent and fun contributions of the presenting influencers. This is an interactive festival – we’re not setting up in an auditorium. Literally fostering an open environment by hosting the event in a loft space, the audience will have the opportunity to interact and engage with the speakers. This will be a memorable experience and no doubt you’ll have lessons to take back to your own life. Who are the most unique or inspirational influencers you’ve worked with? Actress and dancer Elizabeth Adler of Chicago Dance Theatre Ensemble encouraged me to be more open and accept different perspectives. She encourages us to truly see what’s around you by listening to others. This is a great lesson we can all live by. Another influencer I worked with left his corporate lifestyle to pursue what he was truly passionate about. Having that courage to start fresh by transitioning into something new was quite the inspiration. Now’s your chance to get to know Chicago’s young influencers – join the party this July and buy your Glappitnova tickets here before they sell out. For a crazy, unforgettable night, everyone needs to take part in Chicago’s favorite pastime at least once – a party trolley. Chauffeured around the city in a rented trolley car, you can experience 3 hours of moving dance party sing-a-longs with 24 – 30 of your closest friends. 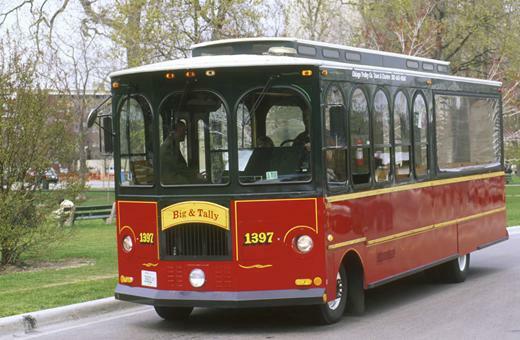 A typical Chicago trolley itinerary involves pick-up at a house or location of your choice, a few stops along the way for bars or photo opportunities, and a drop-off at a final destination – usually a bar or a house. While this trip might seem like a good chance to get in your Chicago sightseeing, the level of rowdiness of the crowd will make that determination. With all of your friends in tow, you can capture great photos outside the planetarium with the skyline in the background. Additionally, you can visit some of the bars outside your usual boundaries without having to worry about taking multiple cabs. Set up your favorite tunes, stock up on your favorite drinks, and gather your crew for a night around town. Of course with all privilege comes responsibility – planning a trolley can be a logistical challenge. As with any event, not all parts will go as planned. Here are some tips for navigating what could be the night of your life. Will your “advanced sound system” amplify my iPod/iPhone playlist? Is the trolley heated/air conditioned, and can the windows be opened? Is gratuity included in the credit card charge, or will the driver expect cash at the end of the ride? Can I get a discounted fare if I “like” you on Facebook? Can you accommodate 25 people sometime between 8 – 10 p.m. with no cover and a limited line? Am I willing to corral 24 – 30 of my friends and hunt them down for their share of the cost? Do I have the patience for last-minute cancellations and added guests? Do I want to buy all the beverages in advance, or ask guests to BYOB? Am I willing to make sure the trolley is spotless at the end to avoid a cleaning fee? Clear communication with the driver is key. Provide an itinerary with addresses in advance, and make sure he/she knows the timing of each bar stop. Tell your guests when to return to the trolley, so no one gets left behind! Our blessed Chicago summer has finally arrived and we all have one goal: Make the most of it! 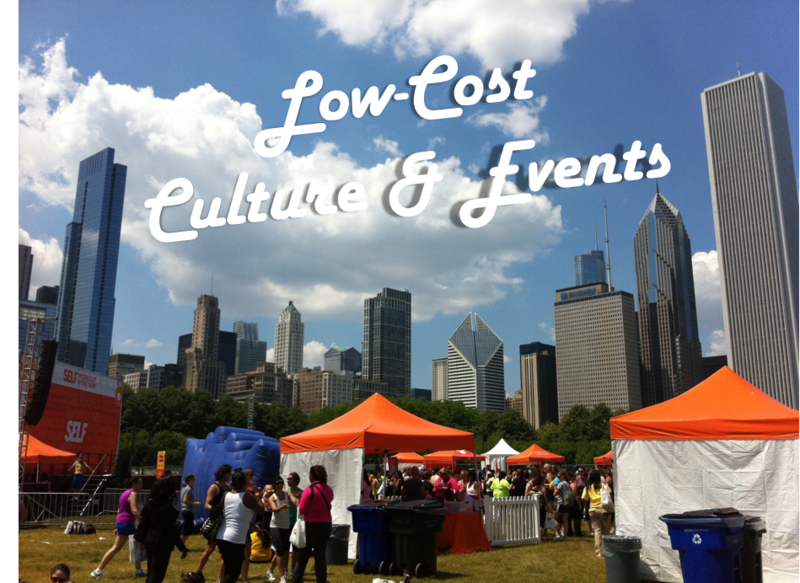 Don your sunglasses and head out the door to enjoy Chicago’s best summer experiences. Because Chicago is so vast and I still have plenty of places I want to try, my list of things to do in Chicago this summer is broken down into two parts – “What I Love” – my own recommendations – and “What I Want to Try” – the places I’ve been dying to go. If you’ve experienced any of the things I want to try, please comment below and let me know how they are! The Southern (1840 W. North) – This outdoor, partly-shaded patio gets sweeter every time I go. Refreshing seasonal cocktails are paired with a rotating southern menu, allowing you to try something new each time. When weather permits, the second story opens up with breezy cabanas for hosting your best group of friends. My favorite experiences have included Johnny Cakes, hushpuppies and even an all-you-can-eat crawfish boil. Oak Street Beach Bistro (1001 N. Lake Shore Drive) – While most know about Castaways, Oak Street Beach Bistro is a tamer version at the next beach over. Don’t worry if your feet are covered in sand, stop in for a beer and some fish tacos while you people-watch the afternoon away. Derby (1224 W. Webster) – Also featuring southern fare and drinks, Derby is fun year-round. When it’s a sunny Saturday in the middle of the summer, Derby is my first choice when I’m looking for outside seating – I’ve been lucky enough to get a seat each time! While the brunch menu isn’t that large, their main menu has an extensive list of choices, all of which you can top off with a Mint Julep, Beermosa or Cool as a Cucumber. Elle on the River (330 N. Wabash) – Situated on the patio outside the Langham Hotel and restaurant Travelle, this sweet new spot is serving up Mediterranean tacos, craft sodas (with the option to add your liquor of choice), and summer-flavored punch bowls titled “Better than a Bradford,” “Elle a Noir” and “Down by the River.” Don’t forget the lovely view of the city over the river. ZED451 (739 N. Clark) – While ZED451’s rooftop is only two floors high, it still offers great city views of the surrounding buildings. 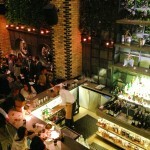 You’ll enter through the restaurant’s first floor bar, climbing a set of stairs to get to the top. With a number of seating options – long benches, two-seater high-tops and mini cabanas for groups – you can sit down and order a bite off the restaurant’s lighter Cravings menu. 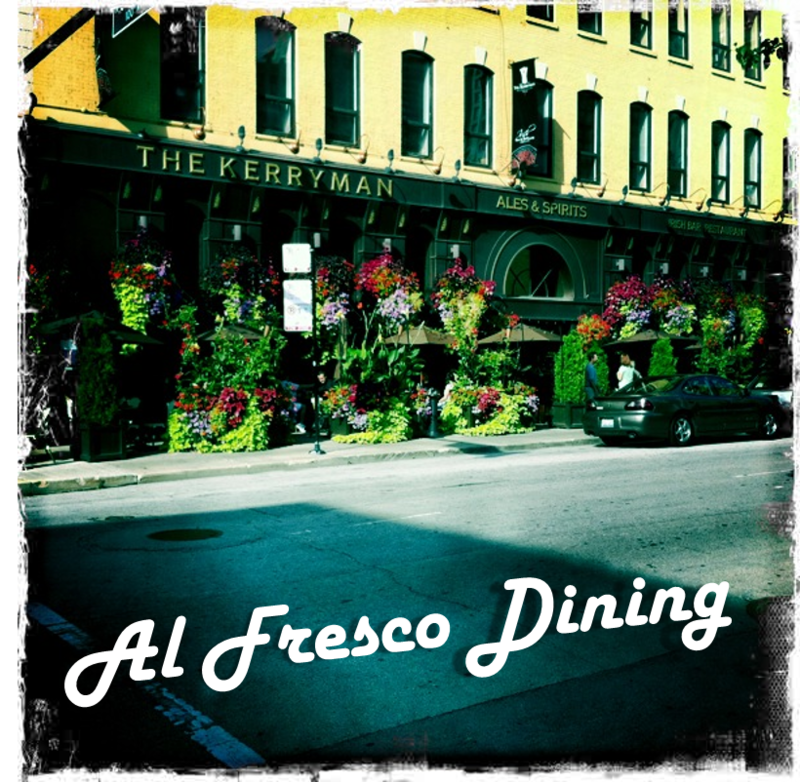 This is a great spot for a special event or a night out with friends. J. Parker (1816 N. Clark) – The drinks may be expensive, but the view makes up for it. Take the special elevator up to the top of Hotel Lincoln and step out to incredible visibility of Lincoln Park and the lake. The view encompasses some of Chicago’s best natural beauty and reinforces your love for this great city. Expect a hip see-and-be-seen crowd, and don’t expect to get a seat during peak hours. I|O Urban Roofscape (127 W. Huron) – Swanky hotel The Godfrey boasts an indoor/outdoor rooftop space serving up food and drinks to its fabulous visitors. Open from breakfast/brunch through late night, the restaurant/bar sits under a retractable roof that allows for year-round entertaining – and they even take reservations! My apartment window overlooks the hotel, leaving me wanting to go every day. One of these days I will make it happen! 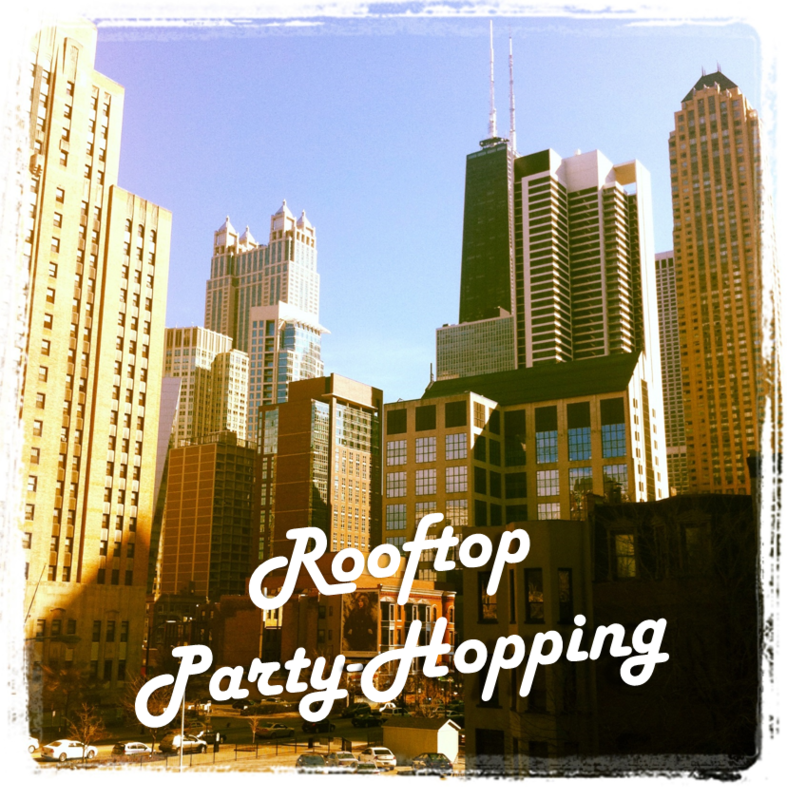 52Eighty Rooftop Lounge (166 E. Superior) – Several of my fellow Chicago bloggers made me jealous with their recent pictures from Mile North Hotel’s new rooftop, 52Eighty. Twenty-eight stories up, this brand-new space looks like it’s going to be one of the summer’s hottest rooftops! Little Goat Rooftop (820 W. Randolph) – My Mom and I stumbled across this little gem while waiting to be seated in Little Goat’s main dining room. This cozy space offers cushioned benches, an outdoor bar, and even a few manicured plants and flowers to enhance the atmosphere. Perched on top of the main restaurant, this rooftop offers a great view in the middle of the West Loop. Since it is adjacent to the dining room that can be rented for private events, the rooftop is only open for very specific hours – please check their website for more details. 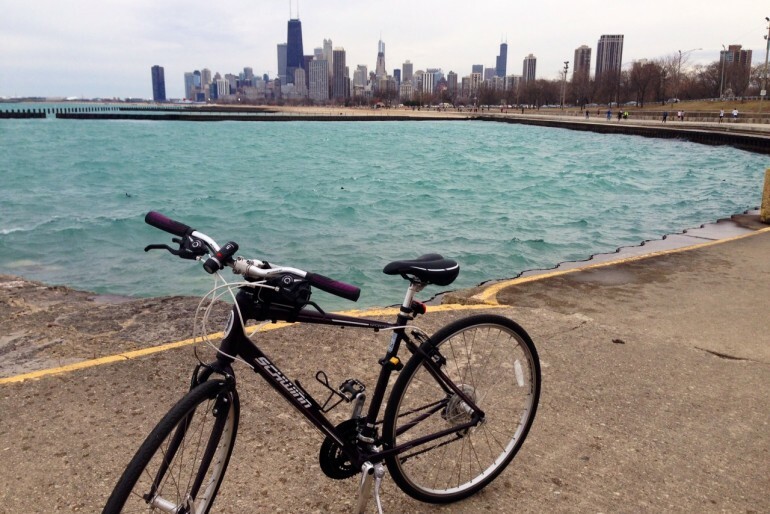 Running the lakefront trail – In my Chicago Marathon training days, I conquered approximately 10 miles (out and back to get in a total of 20!) of that well-worn trail. While the stretch between Fullerton and Oak Street is especially popular due to the beaches, this congested area is not the only scenic part of the route. Heading north between Montrose and Foster you’ll take in expansive fields, nearly empty beaches, and plenty of peaceful spots to camp out for the afternoon. Heading south, you’ll pass by beauties such as the Buckingham Fountain, incredible skyline views by the museum campus, and ultimately more sandy shores looking back up on the loop. The Color Run – Read about my experience at The Color Run and enter to win 2 tickets here. 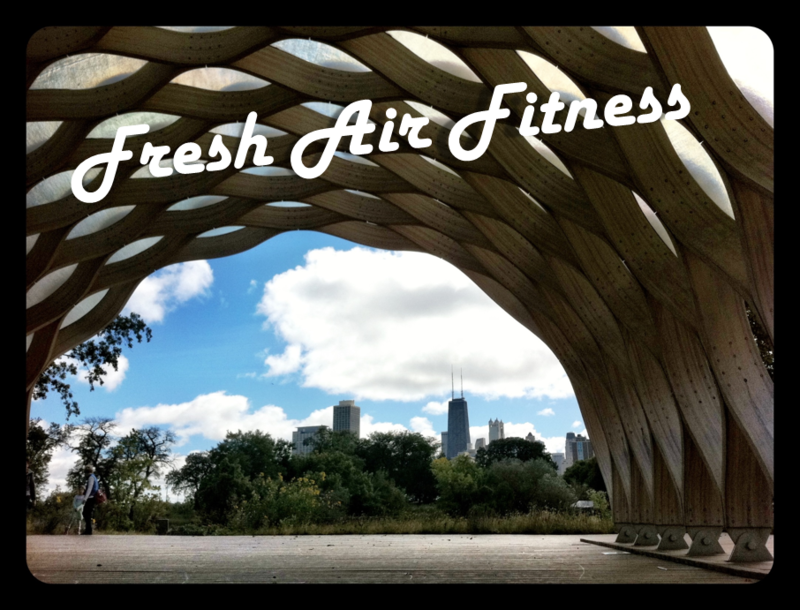 Yoga at Lincoln Park Zoo’s Nature Boardwalk – Held under the unique wooden sculpture modeled after a turtle shell, weekly yoga classes bring your workouts back to nature. In addition to the picturesque view of the city skyline, you’ll be surrounded by wildlife living in the boardwalk’s ecosystem. Curious? You can even try it out for free – on Saturday, May 31 from 9 – 10 a.m. and Sunday, June 1 from 10 – 11 a.m.
Stand-up Paddleboarding – If you haven’t seen pictures of this unique sport, it’s a cross between surfing and kayaking – you’ll stand up on a board and paddle around in the lake. Chicago SUP offers rentals, lessons and even crazy classes such as SUP-Yo (yoga on the board) and SUP-Fit (cross training on the board). Who wants to sign up with me?? Navy Pier Fireworks – Seeing a spectacle in the sky is not just for 4th of July anymore – in Chicago, you can be dazzled with fireworks every Wednesday at 9:30 p.m. and every Saturday at 10:15 p.m. While you can go directly to Navy Pier to view the fireworks shows, I would recommend finding a rooftop to watch them from, or go out on a fireworks cruise on a boat or kayak. Arlington Racetrack – Bring your floppy hats, your sundresses and your bowties to spend a day in the sunshine at Arlington’s beautiful horse racing track. Unlike some of the other horse racing experiences you may have had, you can actually see all of the horses at this track. Even though this location is in the suburbs, it’s easy to take the Metra from Clybourn station and you can even drink on the train. With tickets typically only $12, you’ll get to see the horses race every 20 minutes and grab some food/drinks or place a bet before the next one. The track’s biggest race, the Arlington Million, will be a big party on Saturday, August 16. Farmer’s Markets – There’s nothing like finding fresh inspiration for your dinner from the bountiful produce, meats, cheeses and more flowing from local farmers at Chicago’s many Farmer’s Markets. While my favorite remains the Green City Market in Lincoln Park, many neighborhoods host their own markets on various days of the week, including lunch hours in the Loop. Visit the link above to find one near you. Jazzin’ at the Shedd – I still haven’t made it to this weekly (every Wednesday 5 – 10 p.m. from June 25 – September 3) summer event, but not for lack of trying! I bought tickets/Groupons the past two years but had conflicts both times. This year I am determined to enjoy the concerts featuring rotating artists outside the Shedd Aquarium. Attendees can choose from various food and beverage options for purchase. Bonus points for fireworks in the background and extended hours on select museum exhibits. Free Concerts at Millennium Park – The gorgeous Jay Pritzker Pavilion hosts free concerts throughout the summer, another great spot to bring a blanket and set up a picnic. 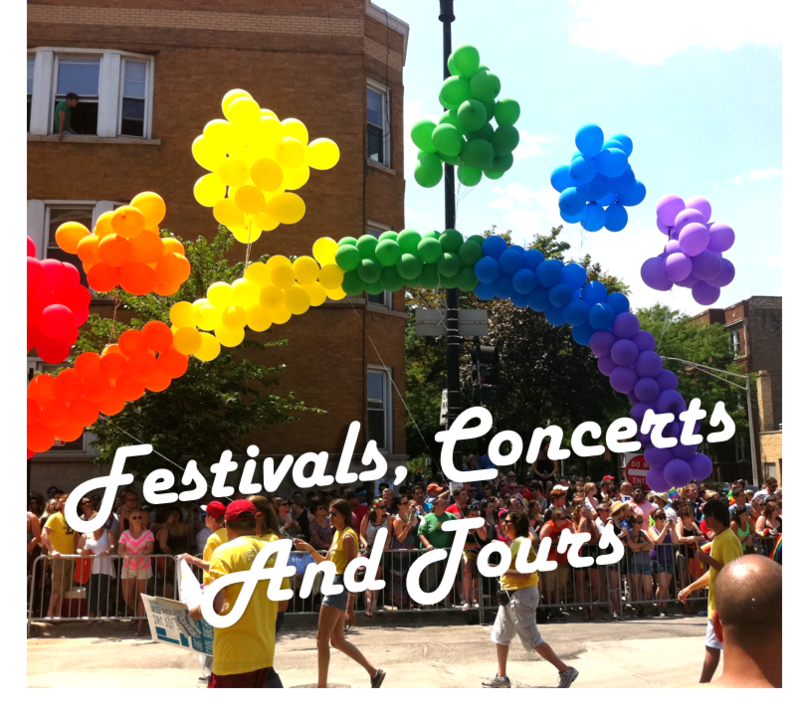 There are several sets of concerts – Loops and Variations, which features new music mixed with electronica on Thursdays at 6:30 p.m., and Downtown Sound, which features varied genres of artists every Monday at 6:30 p.m.
Chicago Pride Parade – This has got to be one of the city’s most fun one-day events. While the Pride Fest takes on a full week of festivities, the parade on June 29 guarantees color, spirit and a whole lot else! Warning: there might be sights you can’t un-see. But don’t let that stop you – the costumes, floats and performances make this a huge street party running for blocks and blocks in Boystown. Chicago Food Planet Tour (Bucktown/Wicker Park) – In addition to getting your fill of Chicago-based delicacies, you’ll be treated to a neighborhood history walking tour. I had the opportunity to learn about the “Beer Baron Mansions,” the painted lady houses, and the history of the park (Wicker Park) itself. This tour also provided my only “official” tutorial on the history, components and principles of the Chicago-style hot dog. Taste of Lincoln Avenue – One of Chicago’s most popular street festivals, Taste of Lincoln Avenue attracts a gathering so large you might end up crowd-surfing. To avoid the congestion, attend at off peak hours, catch one of the local cover bands (such as my favorite 80s cover band, 16 Candles), and sample the flavors of nearby restaurants you’ve never tried. This year’s festival is scheduled for July 26 – 27. Do-Division Street Fest – Held this upcoming weekend, May 30 – June 1, West Town’s street festival hosts concerts, a sidewalk sale of artisan vendors, local food options and even a fashion festival (runway show!). Centered on the unique businesses and shops that make up the area, this festival gives true neighborhood flair and welcome to visitors from all over. Chicago Blues Fest – I feel like I’ve never fully taken advantage of Chicago’s history of blues music. From June 13 – 15, we can experience numerous blues and honorary acts in Grant Park for free. Headliners include Billy Boy Arnold, Bettye LaVette, Dr. John and more. 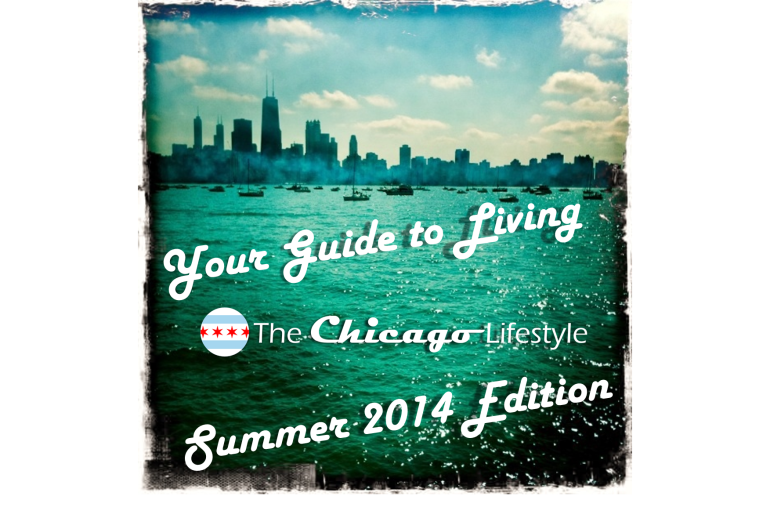 Follow The Chicago Lifestyle’s summer adventures around town on Twitter and Instagram. Which of these have you tried? What tips would you give us for the places we haven’t been? Please comment below! Looking for a new and innovative restaurant that carries a creative attitude across food, drinks and décor? 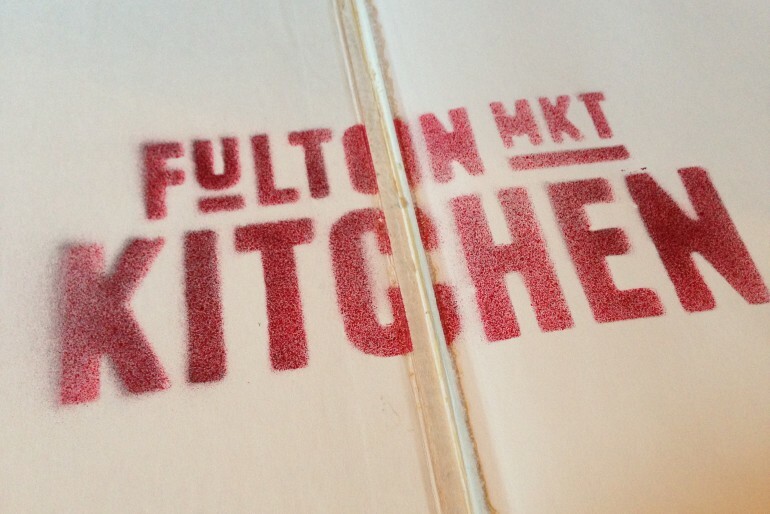 Newcomer Fulton Market Kitchen combines superb flavors with a bold new atmosphere. 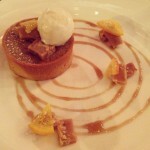 I had the pleasure of dining there this weekend – here’s the scoop on this new hot spot. First – to get there, you’ll step outside the boundaries of Randolph’s “Restaurant Row” and head deeper into the Fulton Market warehouse district. Situated behind a row of parked trucks, you’ll see a black painted building marked with “Post No Bills” signs – don’t get scared away too quickly because you’ll be glad once you step inside. The sunlight spills into the main dining room, lighting up the incredible murals on the walls for the hour before the sun sets and the lights are dimmed for the evening. Featuring a combination of illustrations, portraits, and cartoonish-images, the walls are quite a sight. Textural components such as exposed brick and mini boats hanging from the ceiling round out the décor. Seating in the dining room is a mix of against-the-wall bench seating, high-top tables in the middle, bar seating, and for a lucky large group, a traditional dining table topped with a candelabra. Upon being seated the hostess will hand you a historic storybook, inside of which is your menu. The menu consists of small, medium and large plates, and there are equally as many unique cocktail options. I started with the Light from the Left, a combination of Bourbon, Cynar, blueberry, lemon and Thai basil. Bright and crisp, this is the perfect drink to kick off the spring. The contrast of the berry-colored drink against the deep green basil garnish made the drink both delicious and picture-worthy. Other cocktails on the menu feature flavor combinations such as carrot, ginger, lemon and tarragon (What’s Up Doc) or red pepper, lemon, orange and BBQ bitters (Never Trust a Spaniard). If you try this drink – please let me know what the BBQ bitters taste like! Our choice on the First Canvas (small plates) menu was the Ravioli and Foie, which was so melt-in-your mouth delicious that the pair dining next to us ordered it just based on the looks on our faces. The house-made pasta was so light, in perfect pairing with the rich mushroom, veal and foie gras flavors. With encouragement from our waitress, we ordered the Two Tails from the Second Canvas (medium plates) menu. Imagine an entire lobster tail (cut in half for easy sharing) surrounding crisped pig tail, which tasted like part pork belly and part pork shoulder. Each of the accompaniments – melted leeks, artichokes and burgundy sauce – worked together to enhance and deepen the flavors of the pork and lobster. After two great starters we couldn’t wait for our entrees to arrive. The Skate was a nice, light white fish surrounded by a spring sampling of asparagus, mushrooms, fennel puree, parsley pesto, and a sweet and tangy bite of candied lemon. The Lamb was elegantly presented with cucumber garnish and dots of mint and feta cheese. 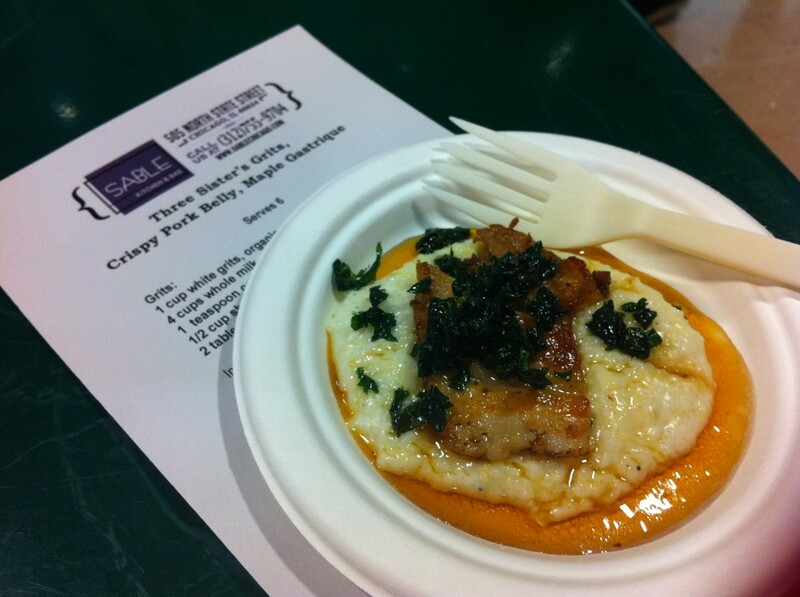 The spiced cauliflower puree tasted like a comforting cheese sauce, which I spread on every savory bite of the lamb. I typically like meat cooked medium, and the lamb was perfectly cooked inside even though the outside looked a little more red. For dessert, rather than offering a standard menu, several special options were presented to us, and we chose a hazelnut tiramisu. The soft creaminess of the top layers were offset by a crunchy bottom akin to a candy bar. The hazelnut, cream and chocolate combination didn’t hurt either. We couldn’t leave without taking a peek into the other rooms in the restaurant. Behind the dining room is a lounge area with pin-tucked leather benches and a separate bar topped with pieces of dining chairs adhered to the wall. The murals in this room feature a sultry-eyed lady and pops of bright colors that stand out in the dim lighting. I will definitely be coming back here for drinks to try more of the creative cocktail menu. Beyond the lounge area sits a private dining room, filled with luxurious velvet high-backed chairs, a sturdy dining table and a gorgeous chandelier, set for a king and queen. This would be a great spot to host a private party and impress your guests. 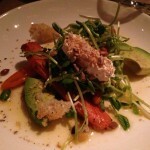 I would recommend Fulton Market Kitchen as a great place to amaze your visual and taste senses alike. Make sure you add this restaurant to your “must go” list to experience the combination of great food and artistic flair. To celebrate National Cheese Fondue Week, you have the pleasure of learning the decades-old artistry of Geja’s swiss fondue. 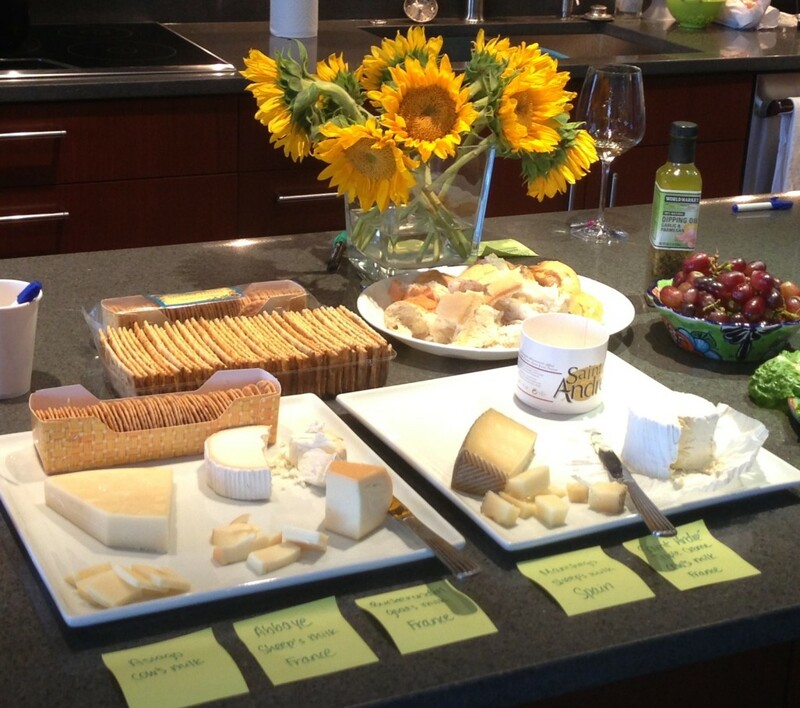 Learn from the best and enjoy wine pairings, and even take home samples of the fondue! In honor of Chicago Dance Month, go see the performances directed by risk-taking choreographers at Stage 773. This contemporary dance show features the work of six choreographers. Discover new artisanal meats, cheeses, craft beers, liquors and more directly from their creators. Held at the French Market, this festival allows you to taste lots of local treats for free! Time: 3 – 6 p.m. or 7 – 10 p.m. This month’s innovative wine tasting is held at a unique gallery in Lincoln Park. Surround yourself with art at this urban loft space while tasting wines and bubbly in the social bubble wine room. Of course, the cheese plate will be a main feature. Party for a cause at the Spring for the Students Gala, benefiting Minds Matter, an organization that pairs students from low-income families with professional mentors, helping them achieve their college preparation and acceptance dreams. Money raised covers the students’ educational needs such as Kaplan prep books, summer school programs, and college application fees. The party features a DJ, open bar, appetizers and desserts as well as a silent auction and raffle. Work on your tan all summer with your friends by joining Chicago Sport and Social Club’s volleyball leagues on North Avenue Beach. With options for all skill levels, the volleyball league is a great way to meet new friends and get some fun in after work. While there is no deadline to sign up, registration is open now and will sell out. Join in the #BaconMonth craze at Lincoln Park’s flagship Whole Foods while Barn & Co.’s Pitmaster Gary Wiviott demonstrates new ways to enjoy bacon. 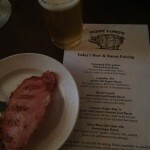 The chef samples are paired with Lagunitas beer samples. Follow the link to buy tickets or call 312-587-0648 to reserve your spot. Ravinia tickets go on sale at 5 a.m. The ultimate summer concert venue, Ravinia encourages long nights of picnicking on the lawn with friends. An easy train ride from the city, Ravinia features hundreds of concerts throughout the summer season. Some of this year’s headliners include One Republic, ZZ Top, Rufus Wainwright, and Willie Nelson. Tickets go on sale at 5 a.m. – headliners sell out quickly but many concert options are open throughout the summer. Enjoy a glass of wine while learning about the zoo’s conservation efforts with rare prairie and reptile species. Get your high-end fashion fix at this annual warehouse sale hosted by Gilt City. Expect racks of clothing, shoes and accessories to choose from. Hint: go early before all the good stuff is gone. Runners, bikers and swimmers alike can browse and buy used gear at the Triathlon Gear Swap. Suit up for your next race or just your summer workouts. Curious about competing in triathlons? Come early for the “Tri 101” class and meet athletes who are happy to share their tips with you. 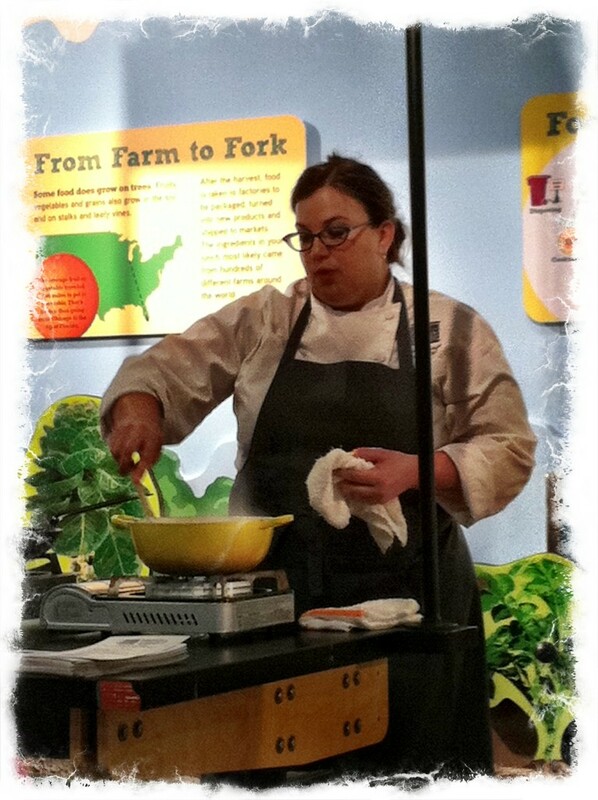 Pour the gelatin mix into a large bowl. Add the 2 cups boiling water, stir until completely dissolved. Stir in the 6 cups chilled vodka. Arrange 1 or 1.5 oz. plastic shot glasses on a tray. Use a liquid measuring cup with a spout or a funnel to carefully pour the mixture into the shot glasses. Chill in the fridge overnight and enjoy in the morning! In a mug, drop in 1 tablespoon of brown sugar. Pour 1.5 oz. Irish whiskey over the sugar. Fill the remainder of the glass with coffee, stirring as you go. Top with fresh whipped cream and optionally, shavings or sprinkles of chocolate. After your morning breakfast and drinks, gather up your crew and head to the river. The 50-year old tradition of dyeing the river green draws approximately 40,000 people, as it’s definitely a sight to see! 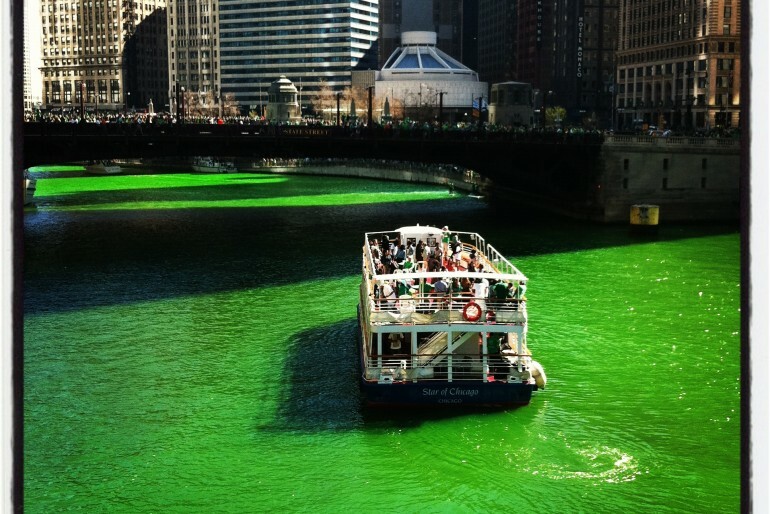 The best places to see the green river are over the bridges between Columbus and Wacker Drive. The riverwalk between Michigan Ave and Columbus is one of the best viewing spots. The dyeing begins at 10:45 a.m. and is visible for about 5 hours, so catch it while it lasts. This year, the polar vortex weather has called into question whether the frozen river can actually be dyed green. According to the parade coordinator, if there’s a will, there’s a way! The plan is to send a large tugboat through the river to break up the ice. Even if there are chunks of ice floating on the surface, the river can still be dyed. This may be the first time in the history of the tradition that weather has impeded the process. No matter what happens, St. Patrick’s celebrations will carry on. After you’ve had your fill of the green river, head to River North to continue your spirited adventures. Most bars and restaurants will have food and drink specials, and the trick is finding a place to convene that isn’t already spilling out into the streets. I can’t go a year without tasting corned beef and cabbage, and as luck would have it, many restaurants are serving this year! 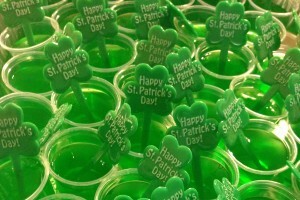 You will see many a St. Paddy’s fan dressed up – in the bars, on the streets, and maybe even swimming in the river. If you see your favorite leprechaun costume, take a picture and post it to Instagram – make sure to tag thechicagolifestyle! 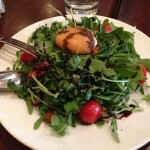 Chicago features some of the finest food in the world, and offers many experiences beyond your typical lunch or dinner. Expand your gastronomic boundaries with these 11 foodie experiences in (and around) Chicago this spring. Learn to assemble the perfect cheese platter, join a Secret Supper club, learn to butcher a hog and more. Experiences are listed in order of cost (low to high). Bon appétit! Do you want free food samples? From some of Chicago’s best chefs? Held indoors at the Peggy Notebaert Nature Museum (2430 N. Cannon) October through April, the Green City Market hosts local chefs each week on Saturdays at 10:30 a.m. They set up a mini kitchen with all the ingredients to demonstrate the creation of some of their favorite dishes, and share those samples with the audience. You can learn the insider secrets that make up the menus of your favorite restaurants. 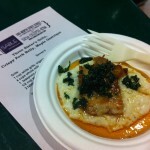 Last year I had the opportunity to see Chef Heather Terhune of Sable give a demonstration, and I benefited from the tasting of cheddar grits topped with grilled pork belly and a maple gastrique. Can’t get enough bacon? Appreciate craft beer? 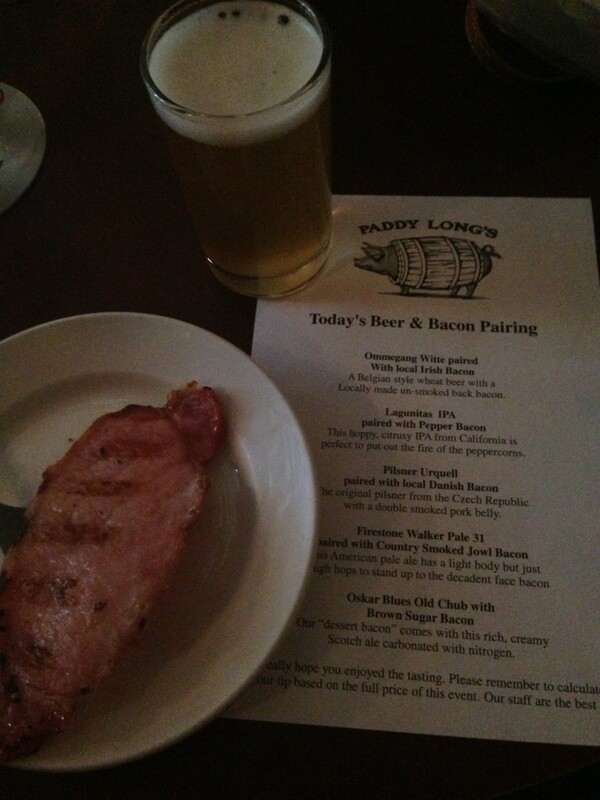 Pair the two at Paddy Long’s (1028 W. Diversey) infamous beer and bacon tasting. Sign up with a group of friends and compete for who can down the most bacon (many of their menu items feature bacon as well). Each slice is served with a description – different cuts, different curing styles, and different toppers such as brown sugar – and the seasonal beers that best complement the tastes. Paddy Long’s features a selection of their 18 beers on tap, which rotate frequently. Most tastings are Saturday evenings and Sunday afternoons, and spots fill up quickly. Tickets are $36. 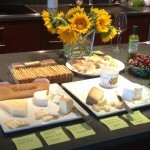 Want to know how to select the perfect cheeses for your next cocktail party? 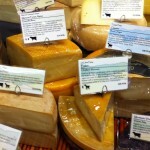 Pastoral, one of Chicago’s finest cheese, bread and wine shops, is hosting “Cheese 101” at their Lakeview location (2947 N. Broadway). 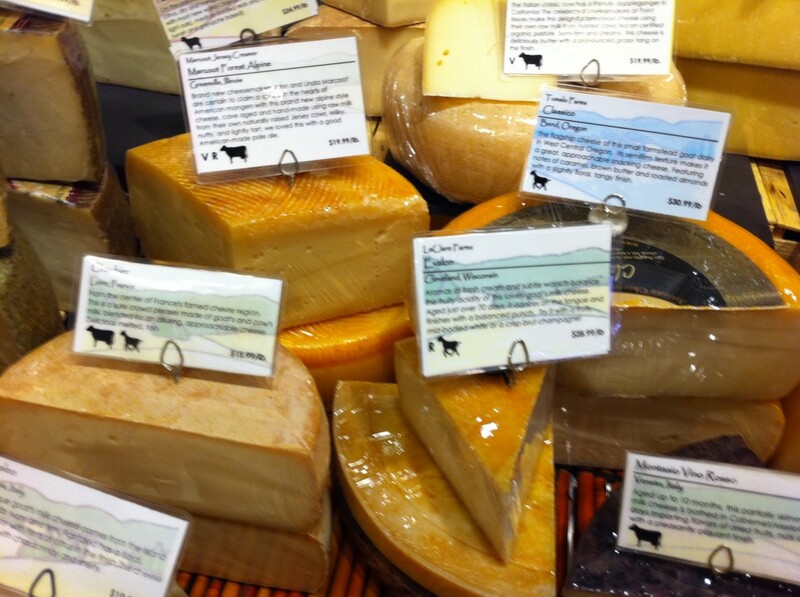 On Saturday, March 29 from 12 – 1 p.m. the master cheese mongers will give a thorough introduction to different varieties of cheese, giving you the know-how to select a well-rounded sampling next time you shop. Tickets, $45 include a glass of wine or beer, with additional drinks available for purchase. Chicago Food Planet has been hosting walking tours since 2006, highlighting Bucktown, Old Town and Chinatown’s delicious treats. Part neighborhood tour and part food sampling, Chicago Food Planet tours are led by knowledgeable guides adding local flavor and tidbits to your repertoire. I had the pleasure of taking this tour and was turned on to restaurants I had never visited before, which are now some of my favorites in the neighborhood. Start your tour with the iconic Chicago-style hot dog at George’s (and show your trivia knowledge of all the original toppings), the newest deli recipes from local artisan shop Goddess & Grocer, a falafel pita sandwich from Sultan’s Market, pizza and beer samples from Piece, fully customizable liquid-nitrogen frozen ice cream from iCream, and more. Since the tours are on foot, they begin in April, and are held Tuesday-Saturday at 11:30 a.m. Tickets are $47 and include all food. You will definitely not leave hungry! Secure your spot in Chicago’s first Secret Supper, where you’ll meet with other mysterious guests at an undisclosed location on Tuesday, April 1 at 7 p.m. Held in cities around the country, Secret Suppers bring together a roster of in-the-know guests to be served by a chef creating a unique menu in a secret location. The event is hosted by Dishcrawl, an organization that brings together friends and strangers alike for progressive dinners, chef encounters and more. With rotating upcoming public events, the Secret Suppers take a special spin on the concept by keeping the menu and location hidden for an air of surprise. Tickets, $89 plus optional wine pairings, will sell out very quickly. This will definitely be an experience you can brag about to your friends! Known for its restaurants, markets, Nutella and Coffee bars and much more, Eataly (43 E. Ohio) also features a cooking school, La Scuola. During a 90-minute demonstration, Eataly’s chefs will take you on a voyage through Umbria, featuring regional ingredients and the basic language related to the culture and gastronomy. Your menu will feature Insalata di Zucca (Butternut Squash Salad), Strangozzi con Burro al Tartufo (Strangozzi with Truffle Butter), Porchetta con Lenticchie (Roasted Umbrian Pork with Lentils), along with a two glasses of wine (red and white). The class is held on Thursday, March 27 at 6:30 p.m. Tickets are $95 and you can register through the link above. The next Italian language class features the Lombardia region, and will be held on Wednesday, April 30. 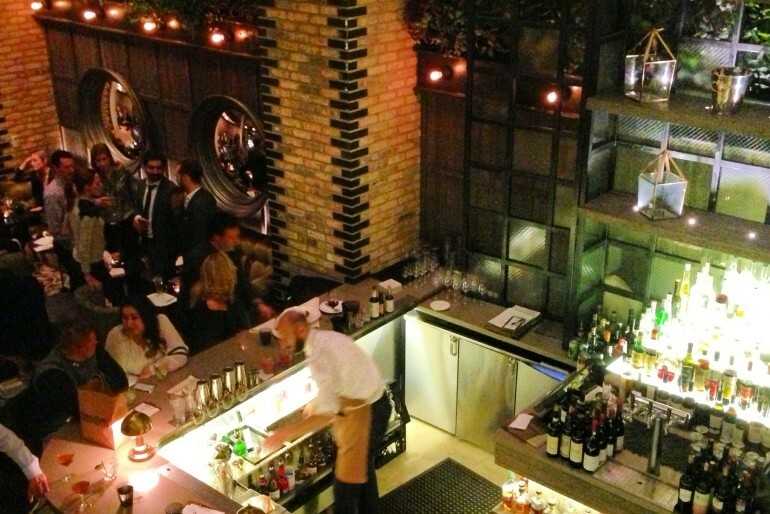 Situated in a secluded location in the Gold Coast, The Drawing Room (937 N. Rush) serves up award-winning meals and equally impressive cocktails. Their menu, changed seasonally, currently features winter flavors such as Winter Squash Crepes with red quinoa, parmesan mornay, charred scallion and crispy sage, and Braised Short Rib Risotto with red wine braised short rib, maitake mushroom, and blue cheese espuma. The richly combined flavors are matched with unique hand-crafted drinks. As the drink menu offers some incredible options, it is best to ask your waiter and Master Bartender to devise the perfect pairing for your meal, and even for each course. This will round out your experience in the subterranean lounge space. Meat lovers only – if you want the full experience on how your meat is prepared, reserve a spot in one of Butcher and the Burger’s (1021 W. Armitage) hog butchery classes. Chef Al will show you how to prepare the animal for cooking. Classes are BYOB and feature a full meal, so come hungry! Upcoming classes are on March 13th and 27th at 6:30 p.m. Call 773-697-3735 to make your reservations. For the fifth year, the Chicago Botanic Garden (1000 Lake Cook Road, Glencoe, IL) hosts three farm-to-table dinners, bringing together farmers, chefs, winemakers and more to serve you a locally-grown meal. You will be seated within a vine-covered trellis in the Regenstein Fruit and Vegetable Garden while learning about how the food is planted, organically grown and harvested. 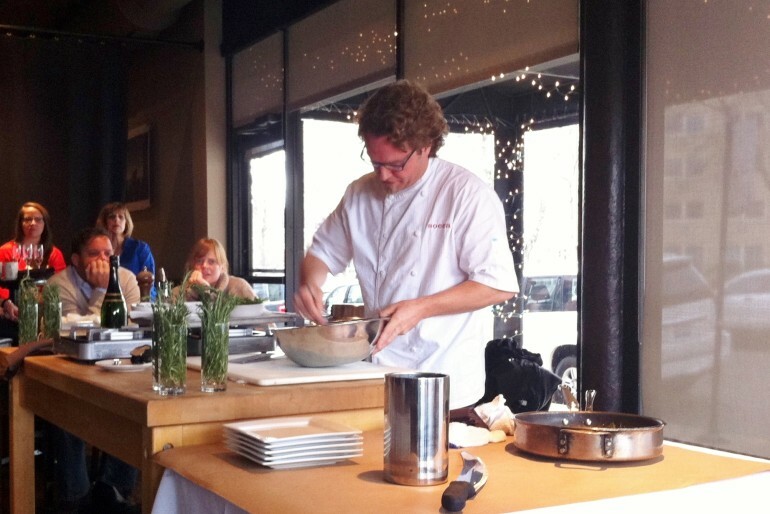 Award-winning Chef Cleetus Friedman orchestrates the multi-course meal. Tickets, $220, feature cocktails and hors d’oeuvres, a tour of the garden, and the multi-course meal, as well as support to the Green Youth Farm program, providing students with opportunities to learn about organic farming. Make your reservations now for this exclusive dinner, held on three dates in 2014: July 16, August 13 and September 3, from 5 – 8 p.m. Looking for an even more exclusive experience? 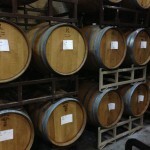 You could create your very own wine blend, in your very own oak barrel, with your very own label. 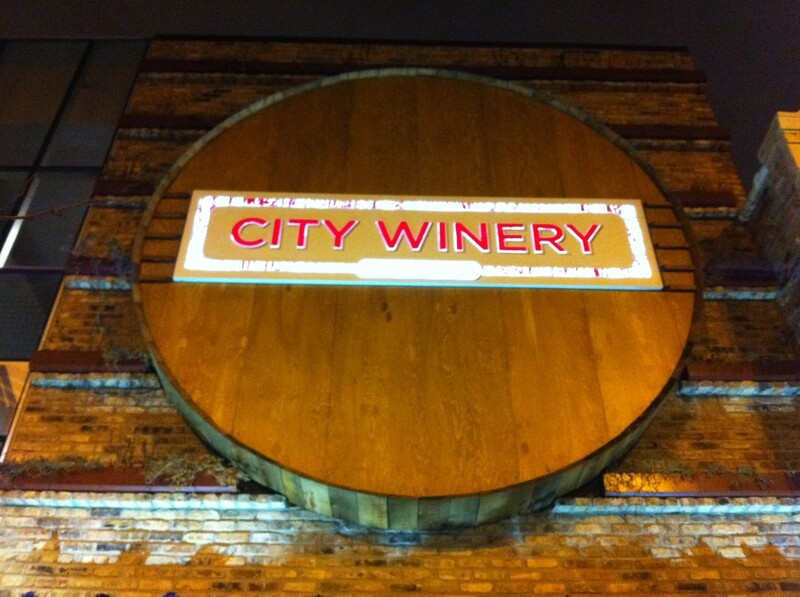 Right in Chicago’s West Loop, you could be sampling and serving your own wine. 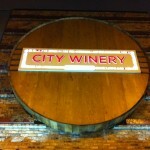 This special program is offered by City Winery (1200 W. Randolph) with customized consultations throughout. You will select which varietal of grapes and vineyard you prefer, and will have the opportunity to get hands-on during the crushing and maceration process after the grapes have been harvested. 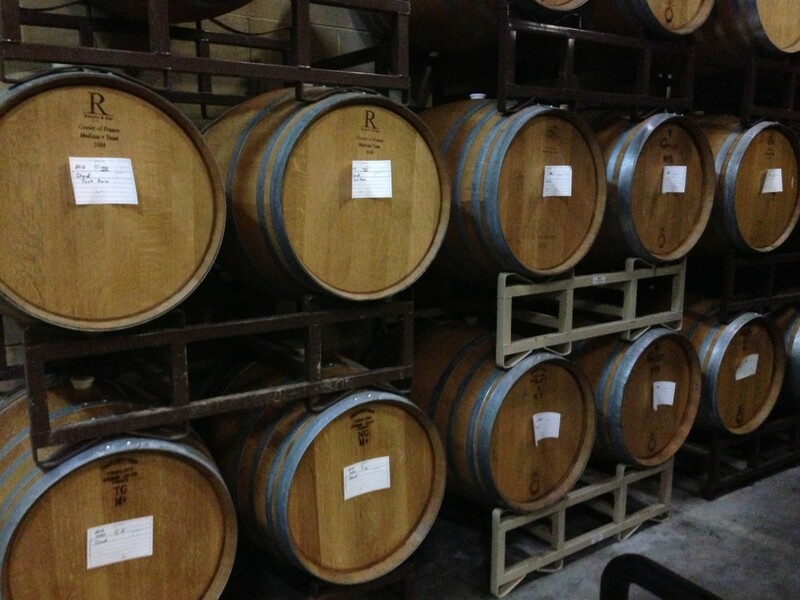 Based on your specifications, the wine will be aged 6 – 24 months, with visits at your preferred frequency. Once your wine has reached its desired age, you will have the option to blend with other City Wineries, or maintain your own varietal selection. Then comes the fully-customized bottle and label design. The in-house designer will craft the perfect label for your personal brand, and the result will garnish 250 bottles for you to enjoy. Have you tried any of these experiences in Chicago? Leave a comment and let us know how they were! Check the Events Calendar page to keep track of these events and more. And – lucky for you – many Chicago Restaurant Week locations are extending their special menus through February 13 or even the end of February! Check out my Twitter feed for the listings. I have been dying to try this Gold Coast newcomer to see what all the raving is about! 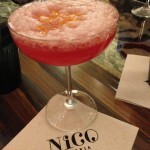 Now I understand – Nico Osteria checks off all the boxes that comprise a great dining experience. Located adjacent to the Thompson Hotel, the restaurant boasts a fun atmosphere, an open view to the food prep area and a look out to the snowy passers-by. Greeted with warm service by each staffer, all of our needs were attended to. Most notable was our waitress, Lynn, whom we were so pleased is a true foodie. 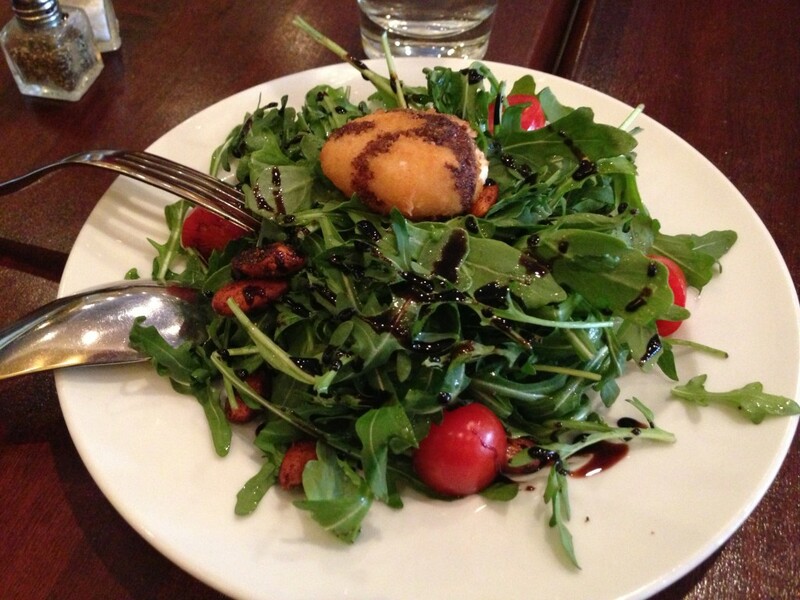 You can tell true foodie passion when you ask what to order – the taste descriptions and suggestions were spot-on. To start us off right, my Dad (my wonderful dining partner) called over the sommelier to figure out which varietal would pair best with our planned menu. We began our meal with the Grilled Octopus Fettuna, a bruschetta of sorts topped with a tasty combo of caramelized shallots, white beans and olives. The pasta menu looked so good that we had to order two – the Fontina Scarpinocc and the Rigatoni with Ragu. For the first – imagine the swirl of sage, cinnamon, almonds and butter – such a delightful combination delicately topped with diced butternut squash. 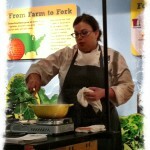 Don’t shy away from the butter – it really brought out the flavor! For the Rigatoni – true comfort food that warms you up on a night like these. 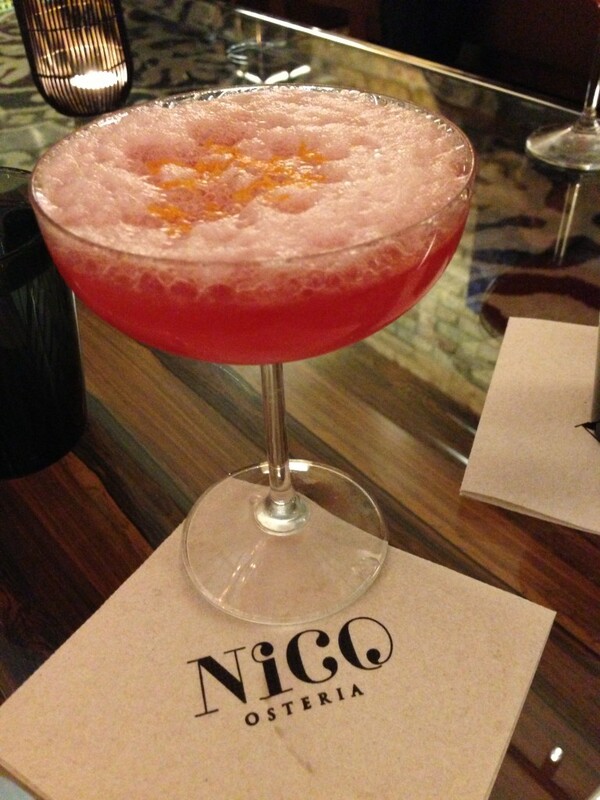 Because Nico’s true passion is seafood, we ordered the Salt Crusted Branzino, which was a nice, light fish topped with the unique flavors of white clamshell mushrooms and zante currants – adding a refreshingly unexpected sweetness. 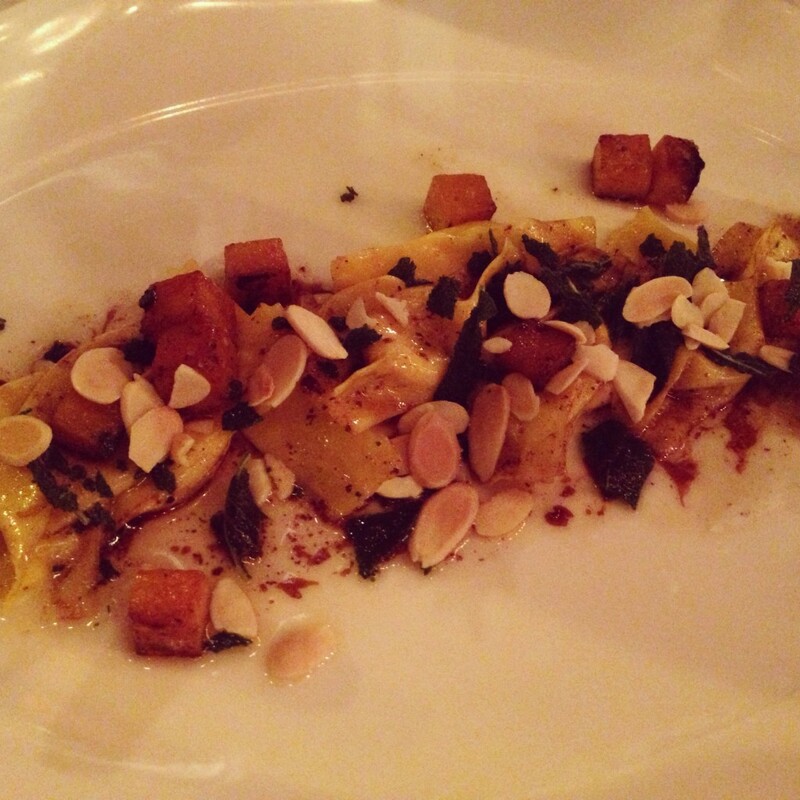 From start to finish, Nico Osteria provided a great experience, and I can’t wait to go back! If you venture just past the restaurant entrance and deeper into the Thompson Hotel you’ll come across a cocktail lounge bustling with Saturday-night vibe. Upon entering, let your eyes flow up past the wall of liquor to the wall of plants, adding greenery and character to this indoor space. 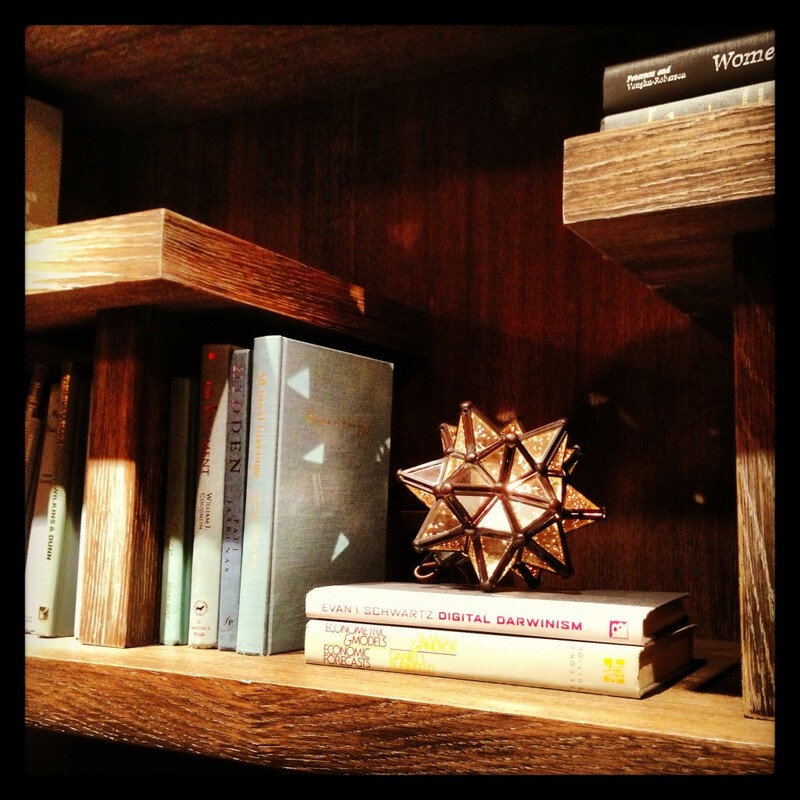 There is a lounge niche to the back, and veering left into the Thompson Hotel lobby you can take the stairs up, past the rustic antler chandelier, to the upstairs bar, which has a great view of the mixings below. Over the sounds of cocktails being shaken and fancy people chit-chatting, you can order off their cocktail menu. For an after dinner drink, I selected the “Gilder,” a mix of vanilla, lemon and blood orange that turned out pink and frothy but was quite delicious and surprisingly not too sweet. 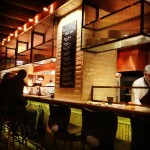 Come check out this new spot after your dinner at Nico Osteria or when passing down Rush Street. Of course, saganaki was one of my favorites. The classic savory Greek cheese, often lit up in flames, adds a special touch to a meal out. Served with a squeeze of lemon, so good! The wild mushroom risotto was a warm and nutty winter favorite, with each type of mushroom adding its own uniqueness to the flavor. 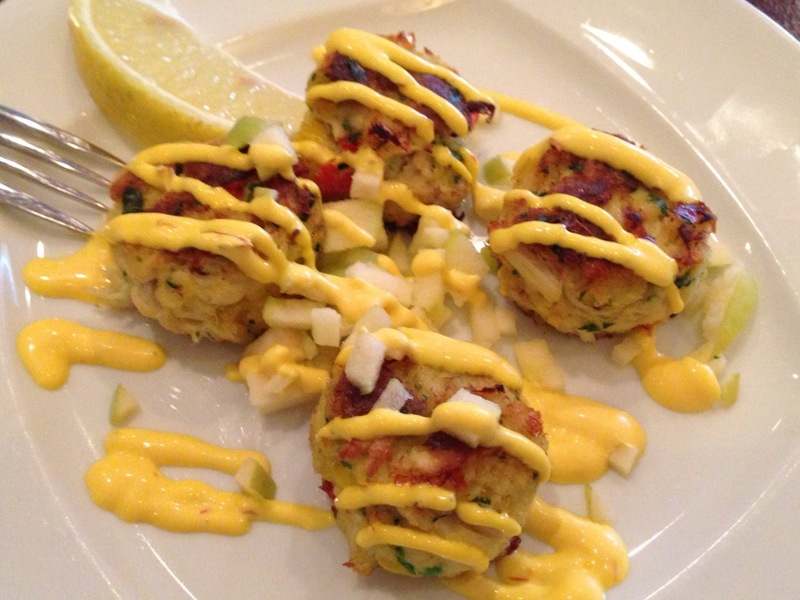 For our seafood course, we chose the crab cakes topped with an artful drizzle of yellow saffron aioli. 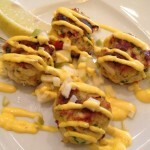 The perfect little bite-sized crab cakes were just the right texture and perfect for sharing. After much debate over the meat course, the lamb and feta meatballs came out a winner. Served with a pomodoro sauce and of course more cheese, the meatballs were a satisfying finale to our savory tapas. 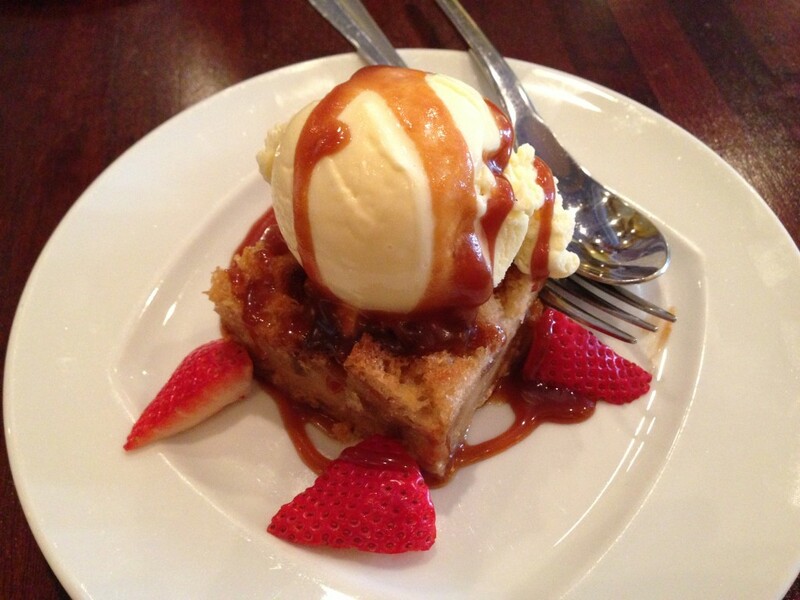 To quench the inevitable sweet tooth, order the bread pudding. 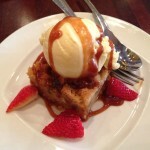 Served warm, topped with caramel and vanilla ice cream, this is the most delightful bread pudding you will ever have. 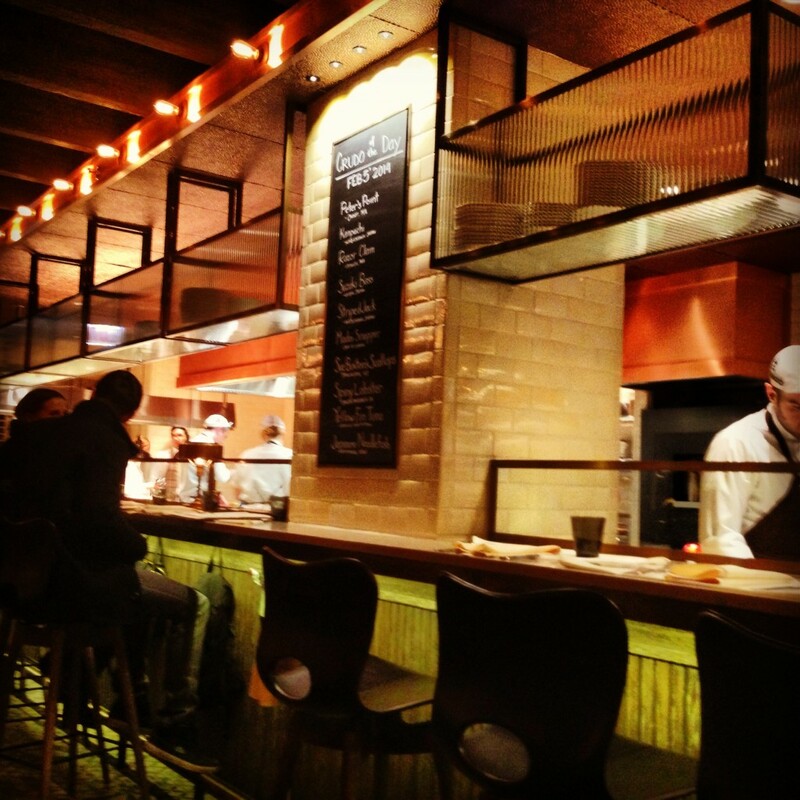 With great options for sharing among large and small groups alike, check out Nia for their tasty tapas in the West Loop! 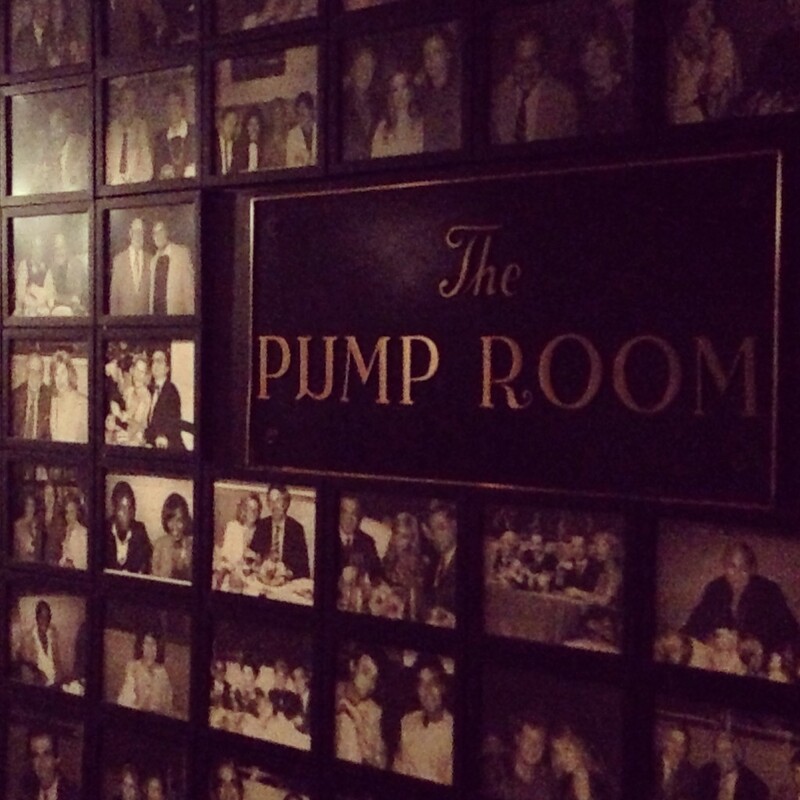 Nestled inside the Public Hotel, the Pump Room greets you with lovely décor and smiling faces. Taking you back to the old school Hollywood glamour, the space carries a beautiful esthetic – a series of round booths topped with unique round lanterns. In the downstairs area (near the restrooms), the walls are lined with black and white photos of fabulous guests from the past. People-watch the patrons to see who is the most fancy, chic or even famous. Not to be overshadowed by the décor, the food presented a wide range of flavors, textures and even temperatures. As the Pump Room was participating in Chicago Restaurant Week, we opted to choose our meals from the special menu. Each of the first course options was a refreshing taste to kick off the meal. 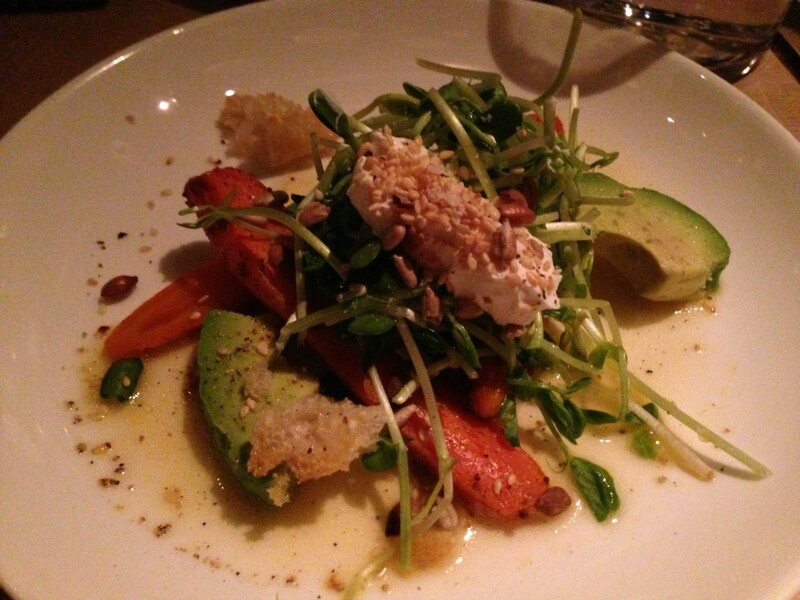 We tried the carrot and avocado salad, which was tossed with sprouts, a bright vinaigrette and topped with a dollop of sour cream. The salmon and rice sushi was a crispy little bite of deliciousness with multiple textures and flavors. 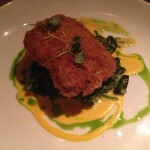 For my entrée I ordered the fried chicken with spinach and buttery hot sauce. So yummy! 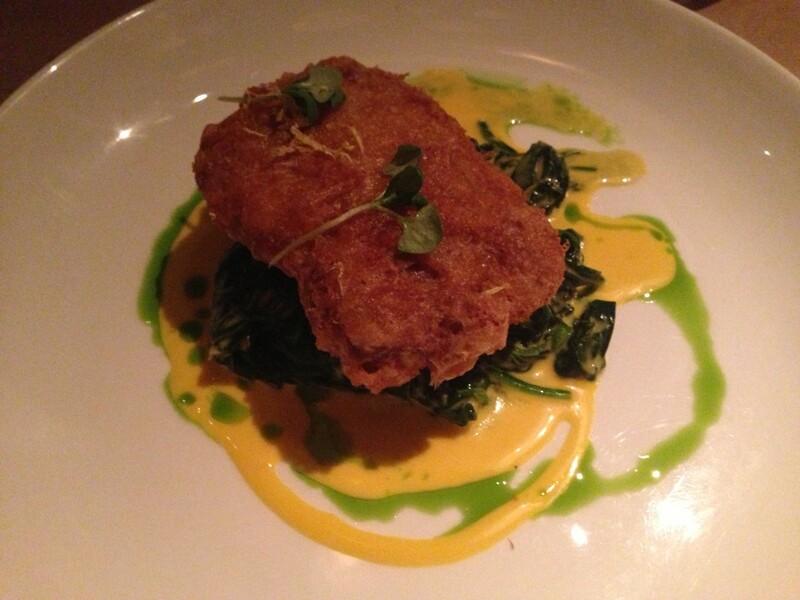 The chicken was perfectly done with a light, crispy shell, mounted atop sautéed spinach as the green contrast to the spicy sauce below. Each bite was better than the last. Until….we received dessert! Cooling down our palates with a cup of ice cream, we were surprised to find all the little treats at the bottom of the cup – popcorn, candied peanuts and a layer of hot fudge. This was a great closeout to a beautiful meal. 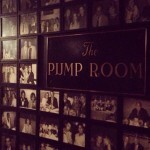 Looking forward to checking out the Pump Room’s other spots including the Library Bar and the coffee shop. In the spirit of fried chicken, get into Leghorn Chicken as soon as it opens its doors. Their luscious but simple menu serves up fried chicken on a buttermilk biscuit accompanied by toppers such as fried green tomatoes and housemade ranch. With some of their guiding principles in contrast with Chick-fil-A’s philosophies, Leghorn Chicken provides a breath of fresh air to the city. Opening soon next to Bub City in River North, Bottlefork is slowly leaking photos of house cocktails, smoked meats and scratch-made desserts, but won’t give any concrete details. Watch for more info! Looking for a new and exciting party scene? 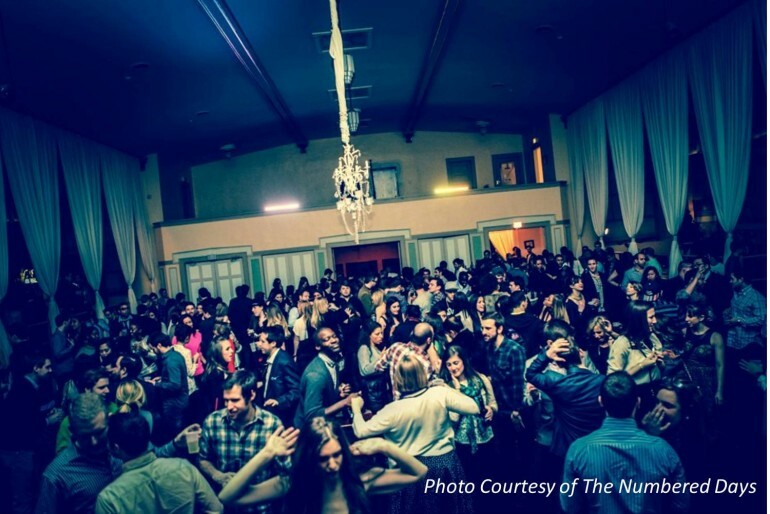 Enter The Numbered Days – an organization designed around throwing the most innovative, interactive, dance-party worthy events in Chicago. Founder Marc Uible designed the organization looking for a little more intrigue and inspiration, taking the concept of connecting and mingling – so frequently found online – and bringing it back into the real world. Join the party with The Numbered Days’ upcoming “Games” event, putting the Olympics in our hands. Celebrate the magic of the winter games through opening and closing ceremonies, friendly competitions and a hands-on crowd sourced painting of the Olympic Village. Imagine stilt-walkers, an interactive photo booth, beach balls in the air and an Olympic-torch lit up by you and your friends. The dance party will be fueled by DJs Matt Roan and Autograf, and it all goes down in the Logan Square Auditorium on Saturday, February 15. Sure–you could escape the cold with another night out at the movies, but why not spend an evening with some real, LIVE actors and take advantage of Chicago Theatre Week! From February 11th-16th tickets are discounted at most participating theatres for as low as $15-$30 (some places less!). Best bets: These selections are based TOTALLY on what l think are must-sees, but since this is Chicago theatre, I guarantee any show you pick will be worth the (discounted!) price of admission. From White Plains (Broken Nose Theatre @ The Greenhouse Theatre Center) – coming off an incredible, GLAAD Award-winning off-Broadway run Michael Perlman’s play about bullying makes its Chicago Debut with the tagline “Just because it gets better doesn’t mean it didn’t happen.” What happens when the nasty, thoughtless words we’ve said as children come back to haunt us in adulthood? Tickets (with discount code) here. Improv All Stars (UP Comedy Club) – Maybe it’s all the “30 Rock” binge-watching I’ve indulged in, but a night of improv (with a “Suggested R” rating) directed by living-legend Mick Napier sounds like the perfect respite from our endless winter. $15 tickets here. Tribes (Steppenwolf) – This story of a deaf man’s quest to find an identity outside his family unit is sparking a vibrant dialog about representations of disability in the theatre (as well as bowling-over critics). See a show in the birthplace of Gary Sinise for only $30! Tickets (with discount code) here. Hedda Gabler (Writer’s Theatre in Glencoe) – The Practically Perfect Kate Fry leads Broadway-bound director Kimberly Senior’s new production; wallow in the winter-time blues with this haunting domestic drama—maybe you won’t leave humming any tunes, but it’s sure to be a knock-out. Tickets (with discount code) here. Rough Crossing (First Folio Theatre, Oakbrook, IL) – this rollicking Tom Stoppard comedy is sure to be hilarious in a new treatment by First Folio Theatre. Performances take place in the historic and gorgeous Mayslake Peabody Estate, so if you’re looking to see something outside the “blackbox” (HA! ), take 290 West for a night in one of the most immersive theatre spaces in the area. Tickets (with discount code) here. 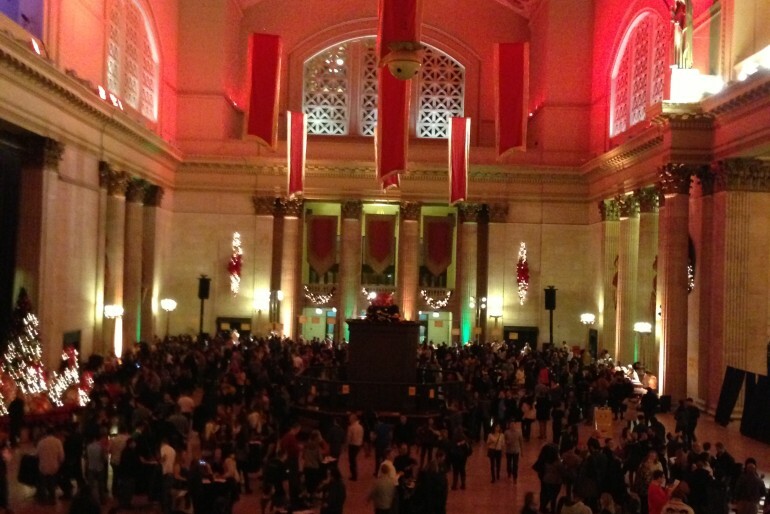 Brave Navy Pier to attend the 2nd annual Chicago Cider Summit. Cider-lovers rejoice at the thought of samples from over 90 ciders around the world, with food pairings. $25 advance tickets will get you 8 tastings and a souvenir glass, with the option to purchase additional tastings. The event is on Saturday, February 8 with two sessions – 11 a.m. – 3 p.m. and 4 – 8 p.m.
Take your charity work to the road by racing in Chiditarod, Chicago’s fourth annual costumed shopping cart relay race fundraiser. Join together with your team to race a shopping cart around the city in one of the largest mobile food drives benefiting the Greater Chicago Food Depository. Trade your ball gown for a crazy costume and expect a day of chaos, fun and laughter. Registration is open now ($55-70 per team) for the Saturday, March 1 event. Over 80,000 pounds have been donated to date, how much can you contribute?